Dr Sen is an expert in nano chemistry and nano-biomaterials with more than 20 years research experience from laboratory scale development to commercial products. He is the principal inventor of PCT application for three Great Britain patents and has published more than 50 high impact peer review journal articles of his original work, two high impact review articles, two book chapters and seven articles in books in the area of nano-biomaterials chemistry. He managed several research projects as a principle investigator in the past and currently managing a unique research area “Magnetic Hyperthermia” in collaboration with nanoscale Biomagnetics SL, Spain funded partially by Royal Society, UK. He is the coordinator of one on-going international project funded by UKERI (www.nanowateratulcan.org) in collaboration with two industrial organisations and one academic organisation. 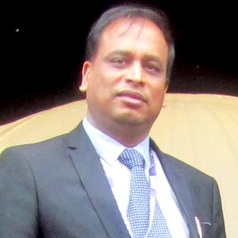 He has successfully delivered one International workshop on magnetic nanomaterials in August 2015 (https://nanowateratuclan.org/an-international-workshop-on-magnetic-nanoparticles/) and one international symposium “Functional Nanomaterials in Industrial Applications: Academic-Industry Meet” in March 2016 (www.nanosymposiumatuclan.net) as a chair / coordinator. June 2015: Washington DC, Clean-tech, Invited keynote speaker on Nanomaterials in CleanTech sharing platform with White House delegates, top Industrial leaders, investors, venture capitalists, Entrepreneurs etc.